The Gilmore Family’s original farm in Ireland was called “Tattykeel”, and in honour of his ancestors John Gilmore chose it to also be the name of his property in Black Springs, NSW. It was here that John and Mavis Gilmore first established the Tattykeel Dorset Horn Stud in 1959 using the best genetics available at the time. Competing at major sheep shows, their sheep quickly became a regular fixture in the winner’s circle. The Tattykeel Poll Dorset Stud was later established in 1964, and the Poll Dorset’s soon became the main breed in the family’s meat sheep studs. As a direct result of the family’s focus on breeding quality sheep, Tattykeel have consistently taken out Broad Ribbons at major shows in NSW and Victoria. Graham and Martin Gilmore took their parents focus on quality a step further and intensified the line breeding principals used in the stud to further improve the quality and consistency of the sheep. 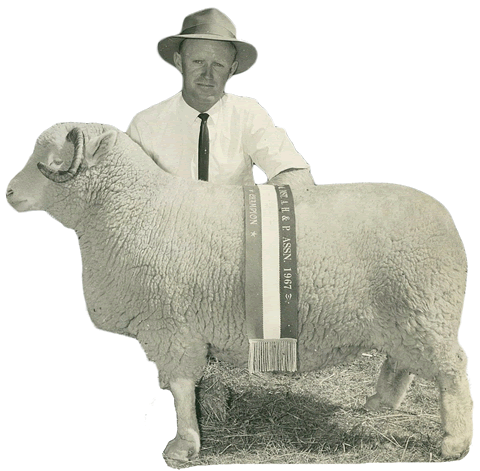 Selective line breeding was also used by the family to enhance positive traits and reduce negative traits in the sheep, and Artificial Insemination and Embryo Transfer programs were introduced to maximise genetic gains. Tattykeel is now considered the most successful Poll Dorset Stud on record in the Australian Show and Sale rings. Over the years they have also been involved with a number of other breeds and have been equally successful in the show ring. These include Texels, East Friesans, White Dorpers, White Suffolks and Border Leicesters. And as with any family business there are always other family members in the background who contribute to the the business’s success, and Martin and Graham have been supported over the years by their sister Michelle with the company book work. Graham and Martin shared their knowledge and passion for breeding quality sheep with Graham’s two sons James and Ross, who decided to come back onto the farm after finishing school. They are now an integral part of the Tattykeel team and have helped grow and develop the family business even more. Graham has travelled the globe sourcing new markets for Tattykeel’s quality sheep genetics which have seen Tattykeel Poll Dorsets & Texels taking out major broad ribbons in some of the world’s largest sheep shows. It was during a trip to South America that Graham first saw the Santa Innes sheep breed. The Santa Innes is a fully haired sheep used for meat production, although it doesn’t have very good carcass shape, there are many other benefits. It was a light bulb moment for Graham – “why do we need wool on a meat sheep?”. The Tattykeel Team agreed that it made sense to design a new haired breed of meat sheep from breed’s already available in Australia. The vision was to have a self replacing meat sheep breed that was easycare, with no need for shearing or parasite treatment, a moderate frame with good muscle pattern that was polyestrous with good mothering instincts. This saw the start of the breeding program to develop the new breed of sheep that would later become known as the Australian White, on the Tattykeel properties in Black Springs NSW. Over the last 12 years the Tattykeel Team has also grown to included Graham’s wife Kirsty, James’s wife Melinda along with their sons Hudson and Wesley, and Ross’s wife Samantha along with their children Emilie and Lawson. Tattykeel is a real family operation with everyone pitching in to make Tattykeel one of the best stud operations in the country. Sadly on 12 July 2018, the Tattykeel family lost Martin at the age of 52. Without Martin’s tireless work and input the Australian White would not exist today. A tribute to Martin can be found here.